I really encourage my patients to get the majority of their vitamins and essential nutrients from whole foods, but let's face it it's hard for most of us to get several servings of fruits and vegetables each day. Another challenge that prevents us from getting all the necessary nutrients from our food is green harvesting. Green harvesting is when our fruits and vegetables are picked before ripening. Since it seems about half of our year is winter, we have to get our produce from other places. Considering they need to travel to us, they can't be picked hen ripe and still be good by the time they reach us. Because of these reasons, I do recommend patients supplement with vitamins - not take them in replacement of fruits and veggies (because I know there are those of you out there that do! ), but in addition to fruits and vegetables. Our bodies need these nutrients in order to function properly. After all, health begins from the inside. What we put into our bodies matter, including the quality of the vitamins we take. How do you choose your vitamins? Do you choose based on the price? On the brand? Maybe you see several commercials for a specific brand and think that they must be great since you see the commercial so often. Or do you choose the ones with the best source of vitamins and minerals? Unfortunately, there aren't many regulations on supplements. Meaning they could be made from synthetic forms of the vitamins that our bodies need, ingredients in them that aren't even listed on the label, or some ingredients listed may not even be in the supplement. This is why it is extremely important for people to do their research about what they are putting into their bodies, or ask their health care practitioner. Most health care practitioners offer better quality supplements in their office and do their own research on the products they carry. So how can you tell if your vitamins are of the best quality or synthetic? The bake test! I tested some of the most common vitamins sold in stores, and also vitamins from supplement companies. 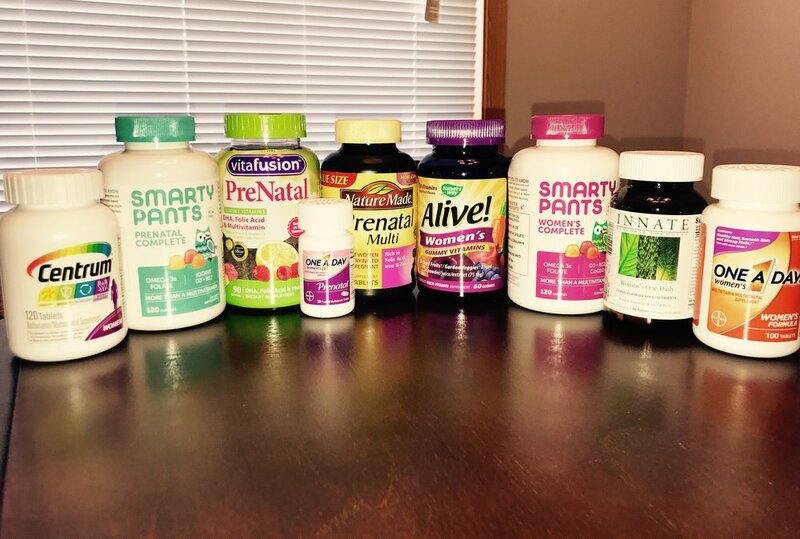 I tested multivitamins and prenatal vitamins, but you can do the bake test for pretty much any vitamin (except liquid forms and liquid capsules). They were baked at 350 degrees for 10-15 minutes. With the bake test we can tell the difference between a plant-sourced/natural vitamin and a synthetic form. What is this black "stuff" I'm referring to? It is actually the harsh binders and fillers in the vitamins that are being cooked out! It looks like a black tar'like substance. And this is after baking... Just from quickly looking at this, #3 and #9 are fails. Number 3 turned completely black when melted and #9 didn't change in shape (which it's supposed to melt). 2. This one didn't change much. However it did start oozing that black stuff, but it's hard to see from this angle. I am showing this one because you can tell from just looking at it that it isn't made from whole foods. What food is naturally this color? 4. Fail - you can clearly see that black sludge. 5. This one passed! It turned a darker brown, but did not have that black sludge oozing out. This one is derived from plant and whole foods. Numbers 6 and 7 passed this bake test, unfortunately the others did not. I want to mention that the vitamin tablets that look artificially colored (i.e. pink, yellow) should be your first clue that they aren't derived from natural sources. Gummy vitamins should be naturally colored from the food sources they are made up of. 6. Just to give you an idea what a gummy should look like after the bake test. Like I mentioned, they should melt and turned slightly darker, if not slightly brown. I hope this post at least makes you think twice about what you are putting into your body and about how it can impact your health. It is so important to give your body the proper nutrients to support every cell, tissue, organ/organ system and function of the body. We only have one body and we need to take care of it!